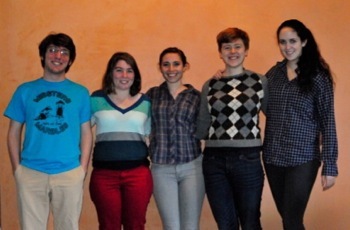 The Grab Bag Theater (GBT) is a local theater group known for hosting student productions, but this holiday season, they will be hosting an alumni show, featuring GBT “graduates” Hannah Rosenfeld, Dana Rust, Claire Jungleib, Zach Abt, and Margaret Ringler (the stage manager). Although this is not specifically a GBT production, the group is financially supporting the alumni and all profits made will support the theater. 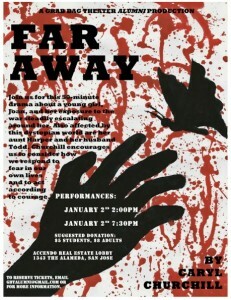 The alumni have decided to put on Caryl Churchill’s Far Away, a darker production that features a girl growing up in a world plagued by war. “It focuses on fear and how to live in a world where everything is polarized,” says Hannah. The show will be held at 1343 Alameda, San Jose in the lobby of Accendo Real Estate on January 2nd at 2:00 p.m. and 7:30 p.m. Ticket donations are suggested, adults $8/students $5. To reserve seats, email [email protected] .